ProTech Data is invaluable to me in keeping my home office network communicating with our other Branch locations. There are few IT providers who have such fast response time and solve problems so quickly! Their IT support staff can service my computer remotely which saves time in correcting my issues. On site they have quickly diagnosed problems with hardware and had me up and running in no time at all. The technical support staff is available 24/7 and provide top notch service. I strongly recommend ProTech Data to anyone in need of an IT provider. It is my pleasure to comment on our relationship with ProTech Data and on the work they have done for us over the past 10 years. 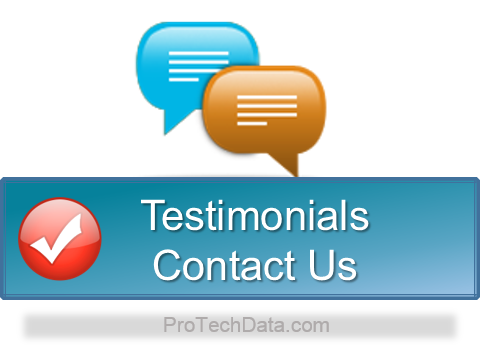 There are few service providers who are as committed, honest, diligent and patient as ProTech Data support team and the consulates. With ProTech Data we have received top notch service and they have helped us grow form with 6 user system to more than 20 users. We were having significant trouble with our network performance due to long cable distances from server room to our desktops computers and all wiring was run through our industrial building over heavy industrial machining interference didn't help matters. ProTech Data diagnosed the problem right way and ran new fiber optics cabling and our network performance increased significantly. ProTech Data has helped us grow our business with the Managed Services offering to cover such things as network security, data backups, and virus protection and 27/7 technical support staff. We feel that they always have our best interest in mind. When questions arise, their group of technicians and network engineers are able to work together to solve all of our problems quickly. If I did not have ProTech Data to always be there to back me up when I have a computer problems, I could not give my clients the service they deserve. I remember when I did something that made my database un-useable, and I was in a panic because I had 3 proposals to do in two days. I called my account advisor while he was on vacation, but even so, he was able to talk me through my problem, and get me up and running, so I could finish the proposals. ProTech Data has always been there for me for the fifteen plus years and I cannot remember a time when I could not get ahold of you when I needed you, or that you could not correct my computer problems. I really love the way that ProTech Data can service my computers without having to come to my office - it saves a tremendous amount of time and expense. If anyone wants to call me about your service, my number is 630-972-0996. I'll tell them how I can count on you to help me out of whatever jam that comes up.